How Do We Know that the Bible is Trustworthy? Blog How Do We Know that the Bible is Trustworthy? For Christians, the Bible is both the source of our beliefs and the instruction for our lives. But how do we explain our certainty that it truly is the Word of God? Barry Cooper has written a tightly-packed gem of a book designed to edify and encourage believers seeking to deepen their confidence in God’s written Word. With candor and warmth Can I Really Trust the Bible? And Other Questions about Scripture, Truth and How God Speaks presents observations that point to the trustworthiness of the Bible. Pausing to respond to plausible questions like “Isn’t the Bible outdated?”, “Hasn’t the Bible been used to justify terrible things?”, and “If God really wants to speak to us through the Bible, why is some of it so hard to understand?”, Cooper explores the historicity, prophecy, and transformative power of this all-important text. 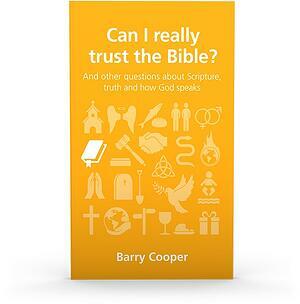 Benefit from Cooper’s clarity and consideration by requesting your copy of Can I Really Trust the Bible? today with your donation to Truth For Life. Purchase a copy of "Can I Really Trust the Bible?"